All Hallows is an Anglican church which is one of the oldest buildings in Tottenham. It was built as All Saints Church in the 12th century and re-dedicated as All Hallows in the 15th century. All Hallows is on Church Lane close to Bruce Castle Museum. The church contains many fine monuments and features. 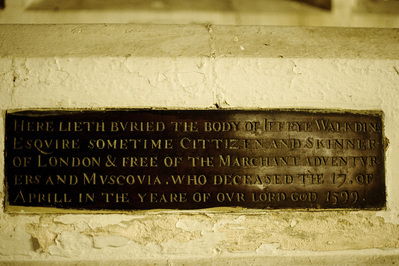 The oldest memorial in the church is to Jefrye Walkdine and is dated 1599. Note the reference to “Muscovia”; the Muscovy was an English trading company chartered in 1555 which originated from the Company of Merchant Adventurers to New Lands. The church has many monumental effigies. The one below to Maria Wilcocks was sculpted by Edward Marshall who worked with Inigo Jones and became Master Carver to King Charles II. Maria was the wife of Sir Richard Barkham and died in 1644. The seven daughters are one of several possible sources of the name Seven Sisters which derives from seven trees planted at Page Green. time together. There have been various plantings of seven trees by seven sisters since then. Across from the Wilcocks’ monument is one to Sir John Melton and wife which shows a more conservative style of commemoration even though it was created at around the same time. Beneath this stands a monument to Richard Candeler and wife, and Sir Fernando Heyborne and wife (née Candeler). Instead of marble one of the figures and the two prayer desks are plaster showing traces of paint. Most of the stained glass is by Alexander Gibbs or school of Alexander Gibbs. Gibbs was a friend of William Butterfield who was responsible for a controversial restoration of the church in 1875-7 and is buried in the churchyard. There is also a rare example of late 16thC French stained glass. Many churches were destroyed during the French Revolution and this glass was salvaged and brought over during the short truce of the Treaty of Amiens and presented to the church in 1807. 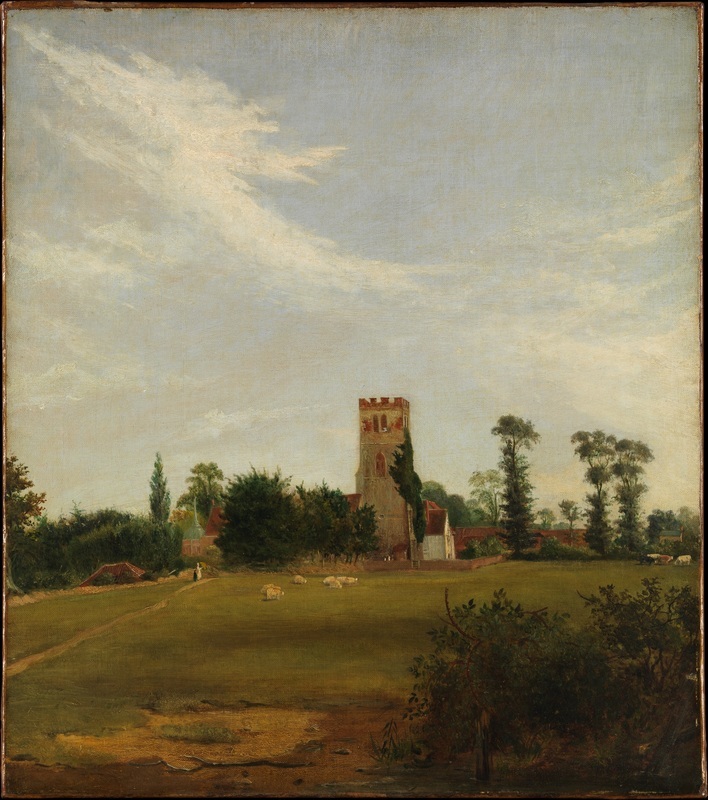 This painting of All Hallows, which is in the Metropolitan Museum of Art, New York, was originally attributed to John Constable but is now recorded as being by a British Painter (ca. 1830). Questions raised concerning the attribution of the painting to Constable appear in the catalogue entry below and there are references to a number of papers discussing the original attribution on the Metropolitan Museum of Art website. Although the painting of All Hallows was not painted by Constable he may have visited the church. All Hallows was the only Church of England church in Tottenham until 1830; Holy Trinity church on Tottenham Green, which stands between the homes of BG Windus and Priscilla Wakefield, was not there at that time of his visits. Luke Howard, whose scheme for naming clouds influenced Constable, moved to a house on Tottenham Green in 1813. The exhibition Behind Sacred Doors: 700 years of Art, Crafts & Architecture from Haringey churches, which was held in Bruce Castle in 2015 features several of the Church of England churches in Tottenham and Hornsey to see the film which accompanied the exhibition click here.